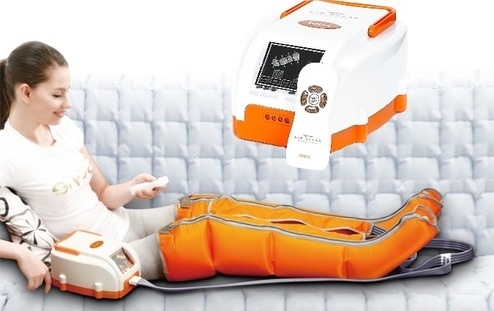 Pressotherapy, or pressure massage, is a lymphatic drainage performed with compressed air. Our pressure massage device has "pants" and "sleeves", which the customer puts on. The air circulates in waves, massaging feet, shins, thighs and if necessary, the buttocks, stomach and arms at the same time. The air moves up from the lower side, which also massages soft tissue. 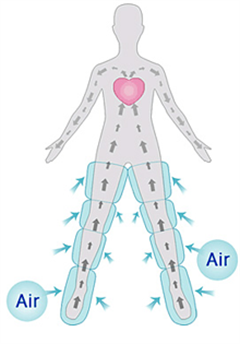 The air pushes blood from the legs and arms towards the heart, improving blood circulation and removing edris. Pressotherapy, or pressure massage, helps the organism remove excess water, along with toxins and other harmful substances. It improves metabolism in the cells and tissue. Pressotherapy is essential for treating cellulite, because it removes the cause - hypoxia and the halt of fluid in fatty tissue under the skin. It is most effective with cellulite treating creams and gels, in the early stages of the illness or as a preventative measure. You can take the treatment every 2-4 days. 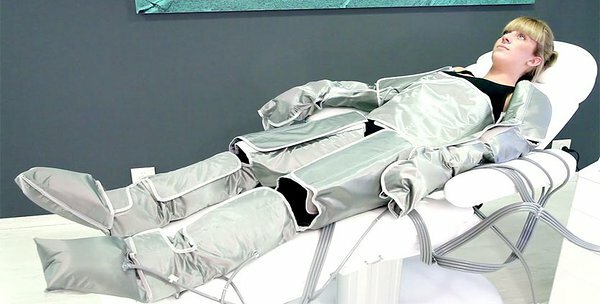 Reducing the possibilities of varicose veins from occurring. Can be performed on legs on the 2nd and 3rd months of pregnancy, but not on the stomach. Even after the first treatment you can feel lightness in your legs and body. Pressure massage is relaxing and cozy and you'll feel well rested and energetic after the treatment. The pressure massage device allows us to set different strengths for the massage and set different modes with different strengths. We can also perform the massage on one certain area, such as your knees. One treatment takes 15 min. 1 area: 2 feet at once, from your toes to the waist. 1 area: buttocks, thighs, stomach. Pressure massage is a cheap, but effective treatment for cellulite.